There are excellent careers available with an International MBA for students who want a career that takes them around the globe. Keep reading to learn why Forbes notes that International MBA programs are becoming more and more popular in the U.S.
International MBA programs are designed for students who want to work in the field of global business. Programs typically include a study abroad segment with cultural and linguistic training. Students learn intercultural management skills, analytical problem solving techniques and international business concepts. International MBA Core Courses include managerial accounting, global entrepreneurship and international supply chain management. Students also learn about multinational negotiations, competitiveness and marketing strategies. 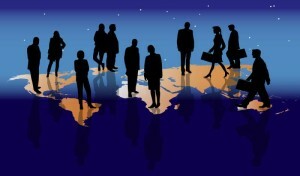 International trade is one of the most popular careers available with an International MBA. International traders work for import or export companies to perform a variety of key roles. For example, they negotiate business agreements, perform market research and facilitate partnerships between local and foreign companies. They analyze international developments and represent their company at major exhibitions and conferences. In fact, there are Foreign Service positions available in the federal government for International MBA students. Some Foreign Service officers are assigned to diplomatic missions abroad in foreign embassies. Every day, the world of international financial management grows as more companies expand their global financial activities. A financial manager could work in the fields of banking, insurance and investments. They typically monitor financial activities within their sector, review reports and forecast market trends. For example, a currency risk manager limits financial risks through using hedging strategies to offset financial uncertainties with changing currency prices. On the other hand, an international cash manager controls global cash flows between multinational sites. Financial managers may go on to be a chief financial officer (CFO). Every international company needs cutting edge technology to succeed. International companies rely on technology for internal and external communication and business processes. IT managers with an International MBA typically oversee major projects and the associated budgets. For example, they may be sent overseas to upgrade an overseas branch’s computer system. On the other hand, they may work with local facilities to integrate cloud computing platforms for employees. IT managers may go on to become an IT director, chief information officer (CIO) or chief technology officer (CTO). According to the Bureau of Labor Statistics (BLS), executives usually have an MBA degree. Top executives oversee business policies and strategies to ensure that companies reach their goals and remain competitive. They plan and direct important operational activities through top management individuals. They are generally responsible for major legal, financial and operational decisions. Being an executive isn’t limited to acting as a chief executive officer. There are actually many types of chief officers, such as chief operating officer (COO) or chief sustainability officer (CSO). Chief operating officers manage department heads for key areas, such as sales, marketing and human resources. On the other hand, many companies are jumping on the green bandwagon by hiring prominent chief sustainability officers to promote their company’s commitment to the environment and community. In short, there are exceptional careers available for graduates with an International MBA. Students can choose from international trade to IT to financial management. To be sure, there are many more careers available with an International MBA for students to explore.